When traveling, you want to be sure your luggage will hold up to the bumps, thumps and scratches that inevitably occur. You also will be looking for features that are useful to them, whether they be extra pockets, comfortable movement or ability to fit everything in. As a frequent traveler myself, I understand the importance of selecting the right luggage. Everyone has different needs and expectations from their product. 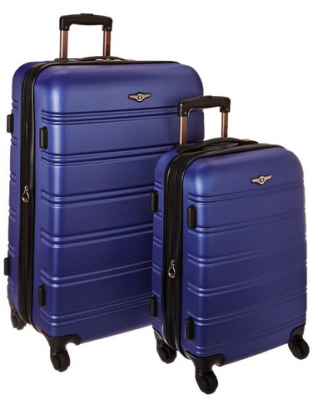 In this article, I introduce three Rockland Luggage sets currently available on Amazon. This article should shine some extra light on whether these products will be the right pick for you. The Rockland luggage line is part of the Fox Luggage group and initially made their appearance in early 2008. One of their appeals is the trendy, vibrant colors they are manufactured in. Luggage types in the range span from large suitcases, to carry-on luggage and rolling backpacks. This gives the buyer a variety of solutions for their travel needs. The bags are made with different materials, including ABS and polyester. Overall, customers generally like the brand, pointing out their good value with a few minor flaws. I have presented here three products from the current line for you to check out. 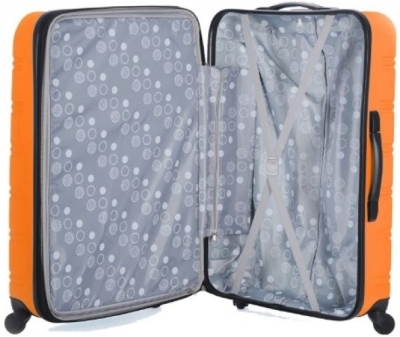 Manufactured with ABS material (the solid, lightweight, plastic-type shell), this 2 piece set comes with a 20 inch carry-on and 28 inch check-in size. Available in many different colors, the set offers value for those looking to purchase two cases in a set for a reasonable price. Conversely, other customers said their luggage held up well after many flights, with some praising the quality of the cases. The easy maneuverability coming from the wheels that spin 360 degrees, along with the comfortable handle was rated positively in several reviews. Some customers have complained of the poor quality structure. 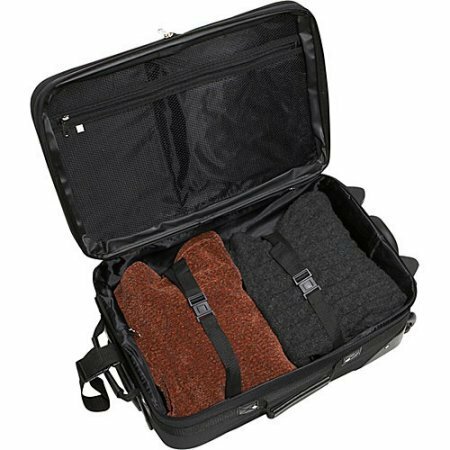 In some cases, it has resulted in the luggage being completely unusable after a short number of trips. Being 6 lbs and 10 lbs respectively, the weight is comparatively higher than other brands on the market. Also produced in a large range of bright colors, the Rockland Melbourne has been slated as a functional choice for the budget conscious. Like the previous model, it is a hard-sided case with expandable zip option. 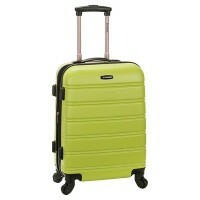 Its 4 wheels are designed for ease of use around the tight confines in airport queues and aircraft. If you’re budget won’t allow spending hundreds of dollars on a carry-on, then this item might be for you. Available quite cheaply, it is a good option for those looking for an inexpensive option. The expandable sides will allow that extra item or two to squeeze inside and the internal divider can come in handy. The low cost nature of the product lends itself to being light on in features. There are mixed reviews on quality, with some experiencing poor construction and flimsy material. One of the professional review sites stated that the handle broke on the first flight. The 4 wheels have also come under fire for not being as easy to maneuver as promised. This is an issue when you are taking your luggage through tight spaces or rushing for a boarding call. The last of the three products presented in this article, the 19” inch spinner offers a few aspects that are different to the other two mentioned. Firstly, it is made out of 100% polyester, an alternative to the hard-shelled plastic outer casing of the previous products. It is also slightly smaller, available in fewer colors and quite noticeably contains two pockets on the outer front side. In line with other Rockland products, it also places itself in an affordable price range. By far the most positive feedback relates to its low price. Many have stated that they could forgive the quality in favor of a very affordable bag. Customers might also prefer the soft nature of the polyester material compared with the hard-shell plastic of others in the Rockland range. The two additional pockets at the front might appeal to some people, and despite its low price, it still manages to have 4 wheels that boast the 360 degree movement. Being heavier than other available carry-on luggage might become a problem as airline policies get stricter. A carry-on bag by itself should not be almost half the regular allowance! There weren’t too many negative comments among users, except for some mentioning again the questionable build quality, specifically with the wheels and handle. Bright designs, functionality and an affordable price are the major advantages of the Rockland range. Having colorful luggage goes beyond pure aesthetics when searching for your luggage on the belt! Being on the cheaper price scale, these products will appeal to many travelers, particularly those that don’t travel often and are simply looking for a practical bag to take their stuff in. Having said that, if you want better quality in terms of comfort in movement and weight, then perhaps these are not for you. If you can look past the lower quality, as some reviewers have mentioned, then the Rockland range presents decent value for luggage that has many of the important features travelers need on their journey.